Ceci est entièrement nouvelle unité meublé 2 chambres / 2bath condo (rez-de-chaussée) est situé dans un cœur de la charmante Rancho Bernardo. Il est un développement bien entretenu dans la communauté de Westwood pacifique. restaurants alimentaires, star bucks, banques, bureau de poste, commerces, épiceries et Costco sont à deux minutes de marche ou de 5-10 minutes en voiture! Il est situé à côté de la Rancho Bernardo Rd. sortie et W. Bernardo Dr, facilement accessible de l'autoroute I-15. Récemment ajouté 40 pouces TV dans la chambre principale. Cette unité est par intégration globale cuisine équipée avec appareils en acier inoxydable, nouveau revêtement de sol stratifié, nouvelle peinture, de nouveaux meubles et des carreaux de céramique dans la cuisine et salle de bains. AC centrale et à air forcé chaleur, des comptoirs en granit dans la cuisine et salle de bains vanité, grande chambre des maîtres avec un lit queen et deux grand espace de rangement avec porte miroir complet, une seconde chambre avec lit double et lits jumeaux et un placard avec porte miroir complet ainsi , une pleine grandeur empilés unité de linge dans un patio privé. Prendre plaisir! nouveau jeu de bistrot pour détente en plein air, Internet haut débit et 47 nouveau de la TV LCD Sony Bravia HDTV En quittant la chambre et dans la chambre principale avec 120 premières chaînes américaines. Tout comme votre maison! Les services incluent une grande piscine, un jacuzzi, un kiosque, des bassins de nénuphars, une aire de jeux pour enfants, un centre de remise en forme et un clubhouse. Il y a 2 places de parking disponibles une couverte (117) 25 pieds de la porte d'entrée et on est ouvert (56) 50 pieds de la porte d'entrée. Tout ce dont vous avez besoin est ici pour votre commodité -linens, vaisselle, ustensiles de cuisine, serviettes de cuisine, savon pour les mains, lavage corporel, shampooing, détergent à lessive et beaucoup plus pour votre séjour. This was our 4th year staying. This year we were a little disappointed because it was not as clean, same bed stuff, pillows etc. we really like the area, close to grocery stores, church, freeway. Even thou we were disappointed we are still renting for 2018. We stayed in the Rancho Bernardo area to be close to family and this place worked great for us as a home base. Thanks for renting with us and giving excellent reviews. For weekly renter (only in summer) we will consider to lower the cleaning fee. Looking forward to provide to see you coming back for your future stay. We really enjoyed staying in a condo for a month compared to a tiny hotel room for the same price. 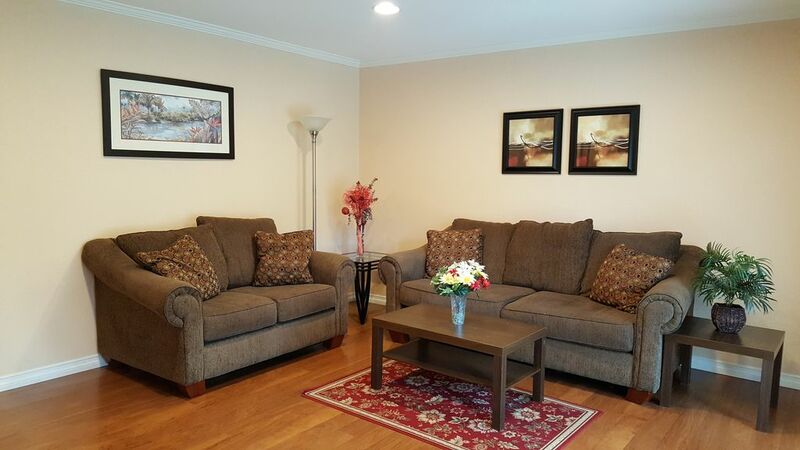 Super convenient location that was 2 minutes from the freeway, making it close to everything. The condo was clean, up-to-date and very comfortable. Side patio was small but handy to sit in and enjoy coffee or cocktails! Wish the wifi was a little faster but the dish tv had a dvr so we didn't miss any of our favorite shows or the Olympics. There is a 3% charge to pay by credit card that gets deducted from your Security deposit, but found out that this can be avoided by using an e-check. Overall we thoroughly enjoyed staying in this gated community and would stay again on our next visit to San Diego. Thank you for sharing your best experience staying in the condo and giving excellent reviews. There are many new upgrades we have done in the condo after your check-out including getting time Warner faster speed internet services with cable and phone services. That's correct, use e-check option when you pay online to avoid credit card transaction fees. Looking forward to see you in the near future. A basic “starter” condo, not "beautiful" nor "peaceful". This property is a basic “starter” condo, run down and poorly furnished. It certainly cannot be described as “beautiful” nor is it “peaceful”, being adjacent to an entry stairwell and the main outlook is onto a busy car park. It provides very basic accommodation with few additional amenities other than a place to sleep. The kitchen is small, crowded, well-worn and minimal in almost every respect. We found perishable food in the refrigerator and cupboards. The patio is barely large enough to accommodate two people with a significant proportion of the space being occupied by the unsightly TV satellite dish. WiFi was quite fast but crashed frequently, leaving us blacked out for long periods. The TV was preprogrammed to record the summer Olympics and periodically automatically reverted to that channel while watching others. Before we checked out the owners tried to add an extra charge to the original quote to cover “credit card fees”. In addition there was a disproportionately large upfront charge for cleaning after our short 7-night stay but also an instruction in the condo for guests to launder the sheets and towels before leaving. The basic cost of the accommodation seemed reasonable based on the listing description but the additional charge and the cleaning fee anomaly changed our perception. So, overall, the condo did not meet expectations we gained from photos and descriptions on the VRBO listing. We would not recommend this condo to friends and family. 1. Is it because cleaning fee is high for you ? We have been renting our condo for 6 year on VRBO and so far we have 40+ renters stayed at the condo and everyone has a very positive reviews/experience and feelings of home away from home. In fact, some renters like condo/location so much so they're keep coming back every year and reserved condo 1 year in advanced. For example, Jane Muller will be coming 3rd time in a row coming again this winter Feb/March 2017. In addition, we rent our condo monthly most of time except summer so it would be just the request to renter if they can wash linen and towels would be nice and helpful but in your case (staying less then a month) I already mentioned over phone if you don’t have time you don’t need to and you did not. It’s not mandatory. For example, for the internet and TV, we already change the time Warner so that fixed the crash out issue and also the dish is out from the patio which makes more space for seating. Thank you for notifying that so we can able to make more better place to stay for future renters. Comfortable, clean and great location! We had a great time! The condo had plenty of space and all the essentials we needed. Very pretty complex with nice pool and very nice playground for little ones. We would definitely rent again! A nice condo in a great area. Easy drive to 4S Ranch Commons, a great shopping area. The ponds and grass area are great for a dog walk, or a little picnic with your grandchildren. The turtles, fish and ducks make it a fun area! Easy to get on the 15 freeway as well. Condo feels very safe! Enjoy. $500 Refundable damage security Deposit/ $1000 Security deposit for 2+month stay Long term renter preferred. For 1+ Month renter $300/month Utilities will be charged Best Rate! Best Location! and Best Condo! !